CBA Project promotes rural economic development in Ukraine. 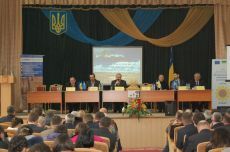 On 29 January 2015 with CBA Project support the Fourth public hearings on "Cooperation as a condition for integration to European market" were organized by ASC Union of Ukraine. The event gathered farmers, cooperators, experts, scientists, and representatives from national authorities. During the hearings participants discussed the status of agricultural service cooperatives and farming enterprises. In particular they analysed specifics of their financial resources, state support, and tax issues. Serhiy Cholak, the Head of ASC “Zhmenka” established in terms of CBA Project piloting in Mykolaiv oblast shared experience of his community. Upon the results of Hearings a Decision act will be approved based on the proposals and comments which they will receive until 31 January 2015. The Decision act will be sent to profile Ministry, Cabinet of Ministers, and Verkhovna Rada of Ukraine.